When taken by mouth, cannabinoid entry into the body is erratic. As little as 4% of an oral dose reaches the bloodstream — too little to be reproducibly and therapeutically useful. ANANDA Scientific is successfully addressing this critical issue by proprietarily making cannabinoids, particularly CBD, bioavailable at unprecedented high levels by employing novel and patent-protected ANANDA Particulate Technology™. For the first time, cannabinoids can be economically, precisely and reproducibly delivered into the bloodstream via mouth. This advance centers about combining cannabinoids with proprietary ANANDA Particulate Technology™ made with GRAS chemistry. “GRAS” is the United States government designation for substances that are Generally Recognized as Safe, (i.e., safe for human use). 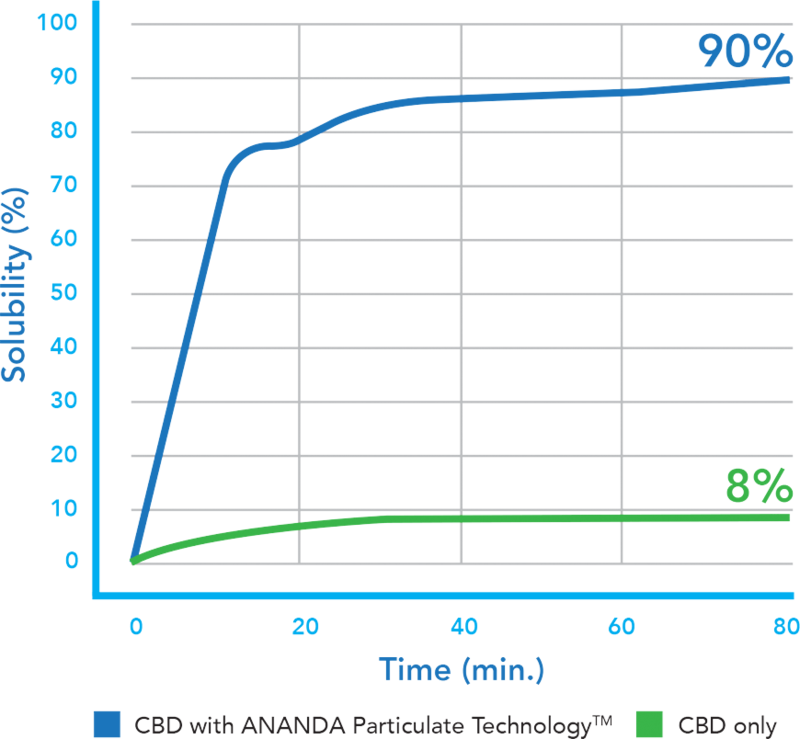 Using ANANDA Particulate Technology™ with CBD dramatically increases the potency for a given dose and a more rapid time-to-effect (minutes, not hours like others). Given its important, proprietary technological advances and necessary evidence-based perspective, ANANDA Scientific is poised to deliver the benefits of CBD and other cannabinoids. The size of the prospective market for cannabinoid therapies, especially those involving CBD, represents an important opportunity to reduce suffering and save lives worldwide. Best Evidence Supports the Non-Psychoative Cannabinoid CBD as the Key Agent for Therapeutic use. More than 3000 scientific and medical works point to the non-psychoactive cannabinoid, CBD as overwhelmingly important for better human health. The non-psychoactivity of CBD permits normal activities (work, school, sports, driving) and eliminates abuse liability.